Our We Can Do It! World War II Exhibit is full of displays, events, programs and speakers. 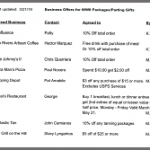 Complete Program Information is listed below including DISCOUNTS at local businesses and where to buy baked goods. The Lawrence County Historical Society’s opening ceremony for its “We Can Do It! 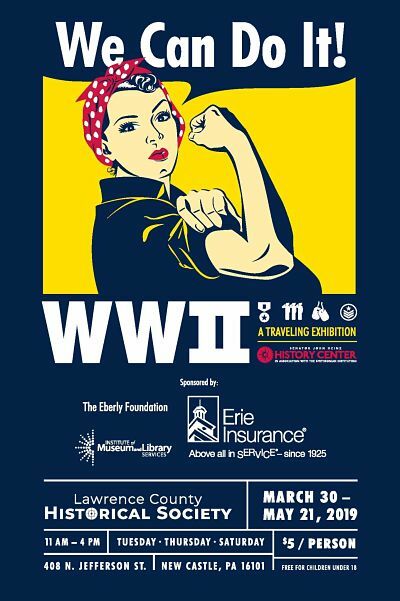 WWII” exhibit will take place at 11 a.m. on Saturday, March 30. A flag raising ceremony with Honor Guard, members of Lawrence County Brass, and a 21 gun salute will highlight the opening on the front lawn. Members of the armed services will be present, and any veterans in attendance will be acknowledged. The traveling exhibit from the Heinz History Center will be on display from March 30 to May 21 on the first floor of the Joseph A. Clavelli Cultural Heritage Center at 408 N. Jefferson St. The exhibit will showcase four lifelike museum figures of local WWII heroes including General George C. Marshall of Uniontown, Tuskegee Airman Lt. Carl J. Woods from Butler, Iwo Jima hero Sgt. Michael Strank from near Johnstown, and the Westinghouse Company inspired Rosie the Riveter. The second floor will feature a war room and two home front rooms. On display will be uniforms, weapons, wall of honor, an air raid shelter, fireside chat area, victory garden, and 1940s china. Local industry, the Tuskegee Airmen, nursing cadets, and Blue Star/Gold Star Mothers will also be represented. The 1940s kitchen on the first floor will have different baked goods every Saturday such as apple pandowdy supplied by Food Experiences Catering. This was a time when sugar was rationed. The cost will be $1 -$2 and includes coffee. 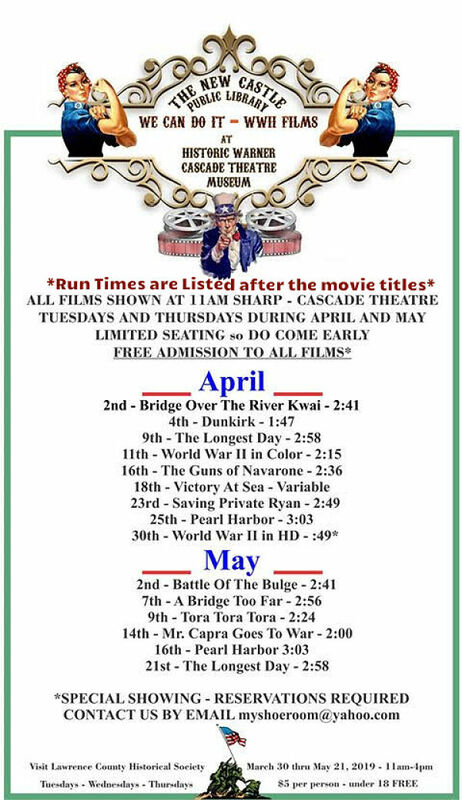 The Historic Warner Cascade Theatre Museum will be showing free WWII movies in downtown New Castle at 11 a.m. every Tuesday and Thursday from April 2 to May 21. This project is in cooperation with the New Castle Public Library and Lawrence County Historical Society. Note that all films are free but that seating is limited. 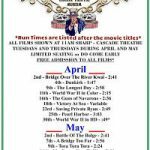 The April 30th showing of WWII in HD is designated for local military – active and retired – and requires a reservation via myshoeroom@aol.com. This film series celebrates, not the concept or evils of war, but rather the men and women who sacrificed so much in service to this Nation. IMPORTANT NOTE: all movies begin at 11 am sharp. The run time of each movie is listed after the Movie Titles. Those with admission tickets from the society will be able to get discounts at local restaurants and businesses. 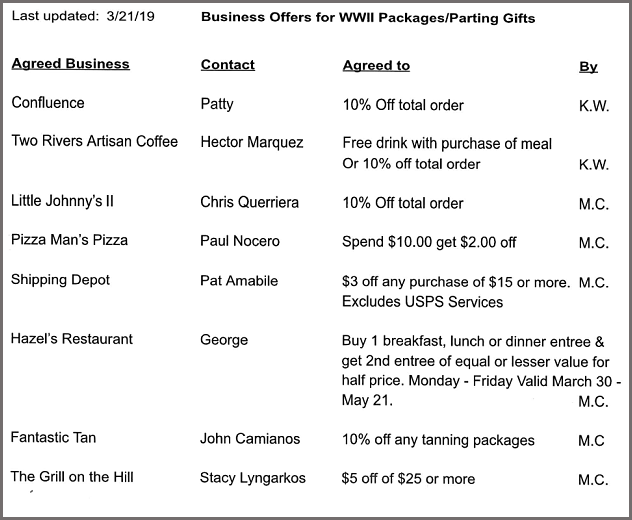 At least eight local businesses are offering World War II packages and/or Parting Gifts. Click on photo to see who is offering discounts. Hours for the exhibit are 11 a.m. to 4 p.m. on Tuesdays, Thursdays, and Saturdays. Admission will be $5, which will include any upcoming programs and speakers on any day. Tickets must be presented. Children under 18 will be free. Go to our events calendar for how to purchase tickets. Just click on the date you want to attend. Or go directly to our Tickets page to purchase. All programs will be in the Medure Annex building at 408 North Jefferson Street, New Castle PA 16101. See our map for detailed location information. For more information call (724)658-4022 or visit the society’s website www.lawrencechs.com for updates on programs, movies at the Warner Theatre, and discounts at local restaurants and businesses.